Written on 16 December 2012 . 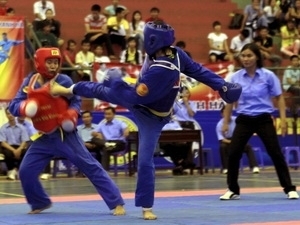 The 1st African Vovinam (Vietnamese martial arts) Championship took place in Algeria from December 13-15. Nearly 60 athletes from six countries, which were Morocco, Mauritania, Senegal, Ivory Coast, Burkina Faso, and Algeria, participated in the event, competing for 24 sets of medals. The host country, Algeria ranked first with 25 medals, followed by Senegal with 18 medals and Morocco with 16 medals. The competition was jointly held by the African Vovinam Federation (FAVV), Algeria Martial Arts Federation, and the Central Vovinam Committee of Algeria. The FAVV was established on Jan 11, 2012 with 13 member countries. The next African Vovinam Championships will be hosted by Ivory Coast in 2014 and Morocco in 2016.